In season from late spring to late summer, fresh blueberries are at their peak in July and August. Juicy and sweet, these round, smooth-skinned berries add the perfect touch of summer to salads, drinks and desserts. For a special treat, check out your farmer’s market for locally grown blueberries, freshly picked and still warm from the sun. Select firm, plump berries with an indigo blue color and a silvery white frost. Avoid any with a green or red tint, which indicates underripe berries. If packaged in a carton, check to make sure there are no juice stains at the bottom of the carton or moldy or crushed berries buried inside. Refrigerate fresh blueberries for up to 1 week. If packaged in a cardboard container, transfer the berries to an airtight container. Check the berries periodically, discarding any that are moldy or crushed. Freeze washed and dried blueberries by placing them in a single layer on a baking pan. Freeze until hard, then transfer to freezer bags. 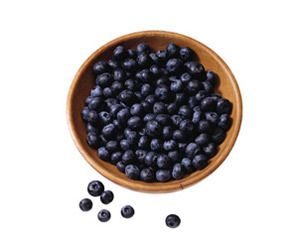 Store frozen blueberries for up to 1 year. Remove and discard any damaged berries and stems. Gently rinse berries under cold water just before using. Spread them out on paper towels to dry. Do not thaw frozen blueberries before adding them to batters to prevent them from leaving blue streaks of juice. Sprinkle fresh blueberries over a serving of BREAKSTONE’S® Cottage Cheese. Stir blueberries into quick bread, muffin or pancake batter. Toss fresh blueberries into a green salad and top with your favorite KRAFT Salad Dressing. Add blueberries to your blender while whipping up summer smoothies and shakes. Replace one-quarter of the fresh fruit in your favorite baked pie with blueberries. Peach and blueberry pie is a real summer treat!